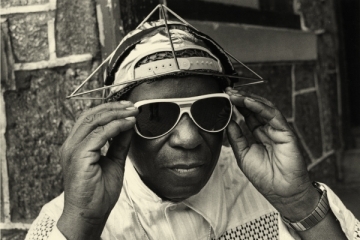 Sun Ra (born Herman Poole Blount, legal name Le Sony'r Ra;May 22, 1914 – May 30, 1993) was an American jazz composer, bandleader, piano and synthesizer player, and poet known for his experimental music, "cosmic" philosophy, prolific output, and theatrical performances. For much of his career, Ra led "The Arkestra", an ensemble with an ever-changing name and flexible line-up.Born and raised in Alabama, Blount eventually became involved in the Chicago jazz scene during the 1940s. He soon abandoned his birth name, taking the name Sun Ra (after Ra, the Egyptian God of the Sun) and developing a complex persona and mythology that would make him a pioneer of Afrofuturism: he claimed he was an alien from Saturn on a mission to preach peace, and throughout his life he consistently denied any ties to his prior identity.His widely eclectic and avant-garde music would eventually touch on virtually the entire history of jazz, ranging from swing music and bebop to free jazz and fusion, and his compositions ranged from keyboard solos to big bands of over 30 musicians. From the mid-1950s until his death, Ra led the musical collective The Arkestra (which featured artists such as Marshall Allen, John Gilmore and June Tyson throughout its various iterations). Its performances often included dancers and musicians dressed in elaborate, futuristic costumes inspired by ancient Egyptian attire and the Space Age.Though his mainstream success was limited, Sun Ra was a prolific recording artist and frequent live performer, and remained both influential and controversial throughout his life for his music and persona. He is now widely considered an innovator; among his distinctions are his pioneering work in free improvisation and modal jazz and his early use of electronic keyboards and synthesizers.Over the course of his career, he recorded dozens of singles and over one hundred full-length albums, comprising well over 1000 songs, making him one of the most prolific recording artists of the 20th century.Following Sun Ra's death in 1993, the Arkestra continues to perform.